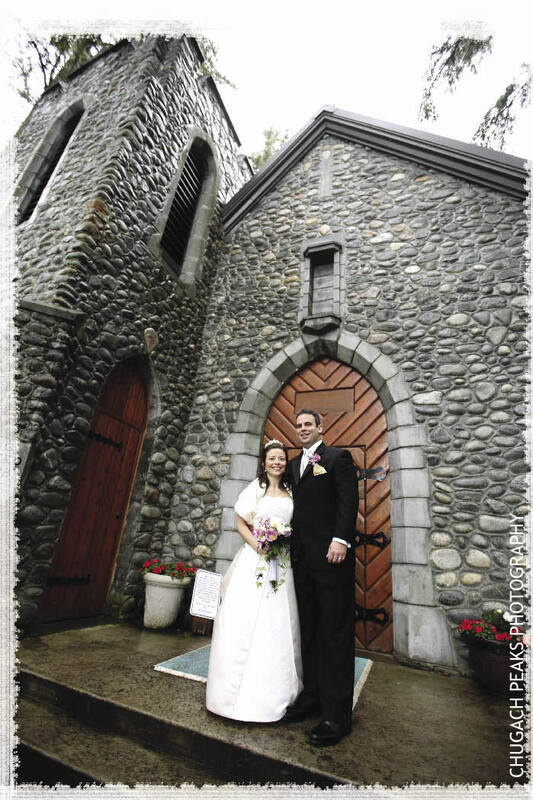 Are you a couple that wants to wed in an old-fashioned country chapel? You know, the one with those sweet details inside and out – like sunlight streaming through stained-glass windows, a steeple, and row upon row of cozy wooden benches? Here are a few cute “chapels of love” we found in Alaska – all worth singing praise. About: The Birch Leaf Chapel is an intimate gathering space that sits atop tailing piles from gold miners. From start-to-finish, the creation of this unique chapel involved 16 local craftsmen. Features: A vaulted ceiling, stained glass windows, wooden chairs and benches. Pricing: $350 facility fee (50% deposit) + $50 cleaning fee for a maximum of 3 hours of use. 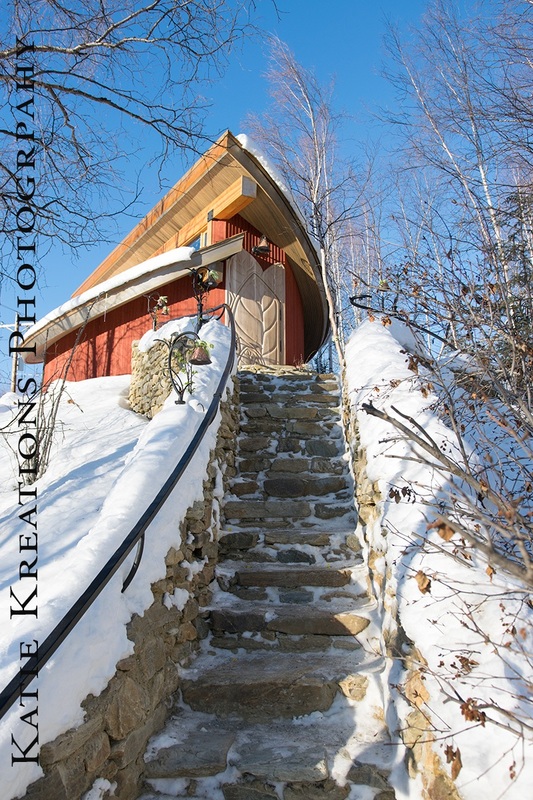 About: The chapel (shown at right) is set in a small mountain community with year-round and weekend residents, who seek refuge to ski, hike and generally renew their hearts and souls in the peaceful surroundings of the Girdwood valley. Features: A cabin feel with vaulted ceilings, French doors, a steeple, and a bride’s room beautifully decorated with antique furniture. Pricing: A wedding fee of $850 includes rehearsal and wedding (4 hours). The church requires liability insurance to be taken out for the event. About: They say the Shrine of St. Therese was built as a labor of love, and serves as the heart of the whole shrine complex. With its unique island setting and notable history, the Shrine Chapel offers a quiet retreat for those seeking gorgeous views of Lynn Canal, wildflowers in the woods, marine mammals and bird life. Features: Classic chapel feel with exterior stone structure, arched windows, wooden pews, high vaulted ceilings and it’s an historic landmark. Pricing: $250, Chapel rental fee + $50 deposit. Reception rentals for the lodge or Jubilee Cabin are between $180-$200, depending on the number of people. Special requirements: The expectation is that either the groom or the bride (or both) is an active catholic. Christians who are active members of protestant and orthodox churches may also be married at the Shrine provided they meet the requirements. Location: Mile 23 Glacier Highway, Juneau. About: A unique log chapel built in 1958 brings out thousands of tourists every year to view this beautiful church, which sits on the shores of Auke Lake. The backdrop is adorned by the snow-covered mountain peaks and the wilderness of Alaska. Features: Cabin-like atmosphere, steeple, vaulted ceilings, wooden pews and it’s an historic landmark. 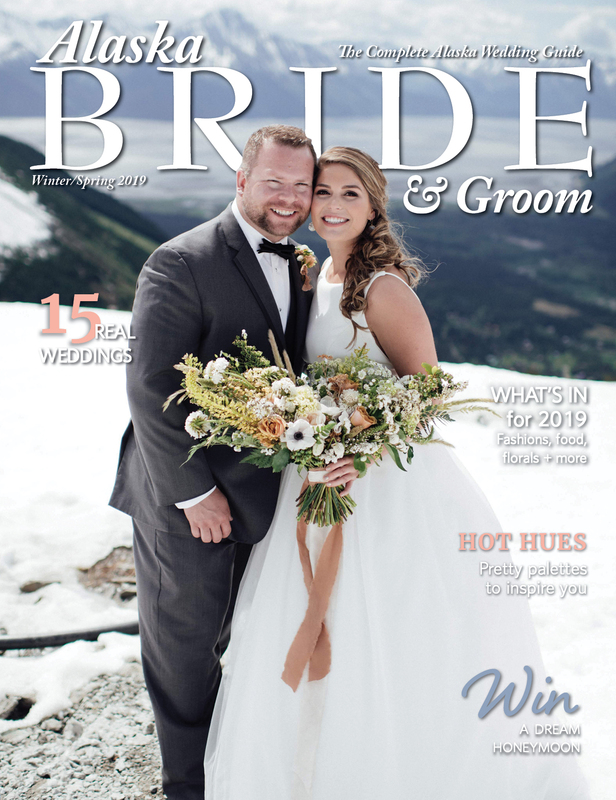 Special Requirements: Christian marriage/wedding; six-month notice; agreement to participate in pre-marital counseling; one of the chapel pastors must officiate; one of the chapel wedding coordinators will be involved in the wedding. 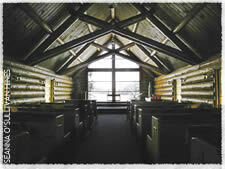 Pricing: Log chapel service is $250. About: The First Presbyterian Church was the first church in Fairbanks, and contains the original stained glass windows from the Chena mission cabin. Features: Vaulted ceilings, wooden benches, stained glass windows and French doors. Pricing: $60 services/weddings; $25 rehearsals; and $50 security deposit. 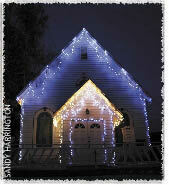 About: St. Peter’s Episcopal Church is the oldest surviving Protestant church building on the Kenai Peninsula. The basement was built in 1904 and the first religious service was held in February 1905. 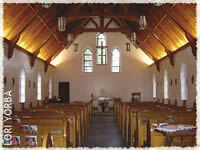 Features: Classic chapel feel with steeple, vaulted ceilings, arched windows, stained glass and wooden pews. Pricing: $250 cleaning deposit; $200 rental fee; $125 reception in basement of church; and additional costs for pastor/priest.